Chieli Minucci is the leader of the Grammy-nominated contemporary jazz group Special EFX, which formed in 1982. Minucci & Special EFX have recorded a combined 25 CDs, 8 of those being solo releases. In addition Minucci has recorded and performed with top pop artists such as Celine Dion, Lionel Richie, Jennifer Lopez, Jewel, Mark Anthony, Jessica Simpson, Anastasia and others, as well as jazz artists Marion Meadows, Jay Beckenstein, Gerald Veasley, Lao Tizer, Nestor Torez, Bob Baldwin, Jeff Lorber, and many others. His father, Ulpio Minucci (concert pianist/composer) wrote the now 'standard' 1955 hit song "Domani," as well as "A Thousand Thoughts of You," and "Felicia" (both sung by Nat King Cole). Also known as a composer for television and film, Minucci was nominated for several Daytime Emmy Awards and has won three, in 1998, 2007, and most recently in 2008, for his compositional work on CBS's The Guiding Light. He has written music for well-known programs such as Good Morning America (theme), Bloomberg Radio (theme), Access Hollywood, The 700 Club, and others. He also contributed music to the soundtracks of Bowfinger (1999) and Panic (2000), as well as most recently to 'Lifted' (2007). Minucci composed and produced the soundtrack for the Live Nation/Nickelodeon live stage productions of the hit TV series, Dora the Explorer (both 'Dora's Pirate Adventure ,' and 'The City of Lost Toys') which are currently touring internationally. He also wrote and recorded songs for the live stage production of the long-running British children's television show, Thomas & Friends Live! - Thomas Saves The Day! Chieli Minucci was born and raised in NYC. Son of Catherine & Ulpio Minucci (concert pianist/composer, who wrote the 50s hit, Domani (Julius LaRosa), A Thousand Thoughts of You, and Felicia (both Nat King Cole). Chieli grew up in Queens, NY, where he still resides today. He began music early on, studying classical piano from the age of 5, and eventually switched over to guitar at 8. He was continually surrounded by the sound of music, through his father's piano playing, and composing, which was to play a key role in his musical future as a writer himself. At age 13 he joined neighborhood friends to form the band, Taurus, which stayed together for about 3 years. Chieli did a great deal of performing and traveling with this band, performing regularly on the Italian Line Cruise ships during Christmas and Easter school holidays, as well as countless school dances and parties, as well as local bars. It was during these teen years that he developed his love for performing, writing, singing, and traveling, all through music. He attended Ithaca College in upstate NY, where he initially majored in music, studying classical guitar, but eventually settled in as an English major. He continued studying music theory, history, solfeggio, composition, and big band arranging, as well as joining various local groups: Amethyst, a folk/pop trio; The New Band, his first foray into fusion-jazz/rock; Fast Food, a new wave vocal/rock group; Colombo, a Brazilian trio; and finally, a long stint in Gumbo, an original instrumental/fusion rock quartet. The college life gave Chieli an opportunity to be a part of many diverse musical situations, which was key in his future as a composer/guitarist. Following college he returned to NYC, studying composition privately with Nicolas Flagello. From ages 23 through 25 Minucci worked with many acts: The Commotion, Fran Eckhart, China Davis Band, Sapho, as well as continuing to write his own music, in particular, pop vocal music, for which he teamed up with lyricists Bobby Matthews and Norman Simon. He performed in various groups, including a two-year stint with Eartha Kitt, and eventually The B.B. & Q. Band (Capital), as well as a brief run with the Lou Reed Band, which featured the rhythm section of Fernando Saunders on bass, as well as J.T. Lewis on drums. (soon to become the first rhythm section lineup of Special EFX). Chieli performed at the original Farm Aid concert with Lou Reed as well. It was during this period that he met Hungarian drummer/percussionist, George Jinda. Soon after meeting George, the two musicians formed Special Delivery, which landed a recording contract in 1982 with Keytone Records, in Holland. Their first LP, simply entitled, Special EFX was eventually picked up for USA distribution by GRP Records (Larry Rosen/Dave Grusin) in NYC. By 1984 Special EFX (newly renamed) had its first US release out in the stores, and the band began its present adventures in touring and performing. Since then Special EFX has recorded 17 CDs, and Chieli has recorded 6 solo CDs on his own. 'Chieli Minucci with Special EFX' is still touring regularly. 'Sweet Surrender' and 'Travels', and 'East of the Sun' are now available. One of the primary composers, since 1999. 71st anniversary season on television! Special EFX's 17th CD release. Thomas & Friends Live! - Thomas Saves The Day ! Grammy nominated and chart-topping sensation Chieli Minucci and Special EFX are at it again! Just in time for their Silver Anniversary the contemporary jazz super-group has crafted the ultimate sonic elixir of mind-bending and mood-enhancing compositions on their latest Shanachie Entertainment CD Sweet Surrender. Proving to be a masterful musical chameleon, guitar wizard, composer and arranger Chieli Minucci produces a recording which embodies all the finest elements of contemporary jazz but in his typical fashion challenges the music to incorporate his influences of jazz, world-fusion, rock, dance and house. “The concept for Sweet Surrender was to capture the intense energy we strive for at a live concert, but in a studio setting. I also wanted to showcase the eclectic styles we've explored over the last 20 plus years,” says Minucci. Sweet Surrender showcases a fresh mix of irresistible grooves filled with funky memorable hooks, lyrical sweeping melodies, head-nodding polyrhythmic romps and dance inducing and body shaking rhythms. Highlights on the CD include “Mystical,” the album’s first single, sure to skyrocket to the top of the charts with its funky syncopated melody, surprising chord changes and infectious grooves and the tour-de-force “Au Naturale” which exposes Chieli’s virtuoso guitar skills and keen compositional chops (Minucci wrote all the songs on the CD). Sweet Surrender also features such standouts as the bluesy and soulful “Guitarzzz” which Minucci describes as a cross between the Allman Brothers and contemporary jazz and the trip-hop and electronica tinged “Ascension,” as well as the carnival-like fare “Children’s Day,” which was penned in homage to an annual neighborhood event in Chieli Minucci’s native Forest Hills, Queens. There are also some tender and hauntingly beautiful moments on Sweet Surrender with tracks like “Chant” featuring the vocals of Philip Hamilton and the title track which Chieli based on the Babyface and Eric Clapton collaboration “Change the World. ”Sweet Surrender features Chieli Minucci alongside 'core' Special EFX band members saxophonist and flutist David Mann, drummer Lionel Cordew, vocalist and percussionist Philip Hamilton, pianist and keyboardist Jay Rowe and bassist Jerry Brooks, as well a few guest musicians. Chieli Minucci was born in Huntington, Long Island, but grew up in nearby Forest Hills, Queens, where he still resides. His father (composer Ulpio Minucci, who wrote songs for Bing Crosby, Julius LaRosa, and Nat King Cole) introduced him to the piano at age six and encouraged him to become a composer. Now Chieli is passing this love on to his own son who is a budding young bassist. His daughter, by the way, is also a musician. Three generations of musical Minucci’s….Look out! Chieli fell in love with the guitar at age eight, a love-affair that continues today. He formed his first group, Taurus, at age 13 and got his introduction to jazz while attending Ithaca College in upstate New York. After college he gained some invaluable on-the-gig training with the NYC-based R&B band BB & Q. He then met percussionist George Jinda at a jam session and they formed Special EFX in 1982, recording for GRP, JVC and ultimately Shanachie as they helped chart the evolution of contemporary jazz. Minucci also recorded three solo projects for JVC before signing with Shanachie in 2000. His previous Shanachie releases, Sweet on You and Night Grooves both spawned top charting Smooth Jazz radio singles (with “Cruise Control” from Special EFX’s Butterfly staying at #1 an incredible five weeks and "My Girl Sunday" from Sweet on You hitting #2, and more recently, “Kickin’ It Hard,” from Night Grooves staying on the charts for a record breaking 33 weeks!) Clearly Chieli has arrived as a solo artist. Chieli also has earned several Emmy Award nominations for his music on the long-running NBC daytime drama "The Guiding Light"(winning one in 1998) and has worked with Gotham Music on their productions of CDs geared toward such niche directions as extreme sports, horror music and orchestral music for the post-9/ll project Patriotism & Explosive Drama. In 2003 Special EFX released the well-received Party which featured the popular single “Ladies Man.” In 2005 Chieli Minucci released Got it Goin’ On which spawned the top five hit “The Juice.” It was followed by the DVD A Night with Chieli Minucci & Special EFX which showcased a high-octane performance recorded at the world famous Harbourfront Centre Theatre in Toronto. Lionel Richie ”To Love A Woman"
•	The Best Of Chaka Khan Warner Bros. Guiding Light. Has composed over 600 individual cues. Thomas & Friends Live! - Thomas Saves The Day! As one of the chief composers,recorded/composed/performed more than 75 individual CDs for Manny Kallin’s, Gotham Music between 1998-2009. These music ‘beds’ have appeared in dozens of television and radio programs/jingles,as well as major motion pictures. 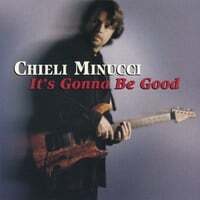 If you think you have heard good jazz guitar, think again...this CD shows that there is a master out there...Minucci is so at ease with the beats and melodies...I wish every song was twenty minutes long! This CD can shape and mold whatever mood you are in and make you want to get up and shake.